and saw the mention about my work. 4) Government information aggregator – This one is close to my heart; a tool that aggregated government information to empower journalists with data. I am very happy to get comment like this from Yourstory. Thanks to Yourstory for covering it. With this tool I would like to help journalists and socially active people who are trying to make difference at ground level. Being in metros we have access good new papers like The Hindu, good internet access to visit different news sites. But if you go any tier II or III cities and read the local news paper there then we do not see similar quality content. This is because journalists or people do not have access to technology by which they can backup their stories with relevant data. So the idea here is to get the data from government website like data.gov.in and list of policies government has implemented over time. And then try link them together to see what difference those policies have made. Education is just an example. 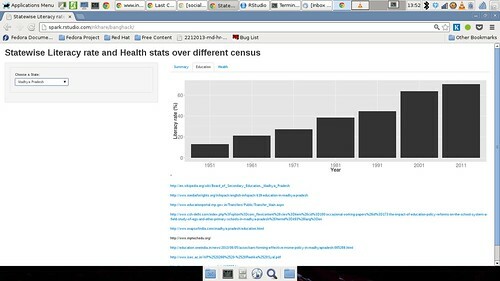 We can get the similar data from sites like data.gov.in for health, food producation, manufacturing etc. For now the user have to look at the listed policies manually but this narrows down search. We talked about state wise here but this can be extended to district level. If we can visualize percentage changes in different sectors for a given district over the years then journalist or others can pick up that data and ask questions to local governing bodies. The data-set would be picked from the government websites, so there is no question about authencity. We just need to visualize them and share. I have written the app using R and Shiny for which I recently reviewed a book. The book should get publish in a next month. I never heard about Sequioa Captial, till I came to know about Bangalore Hackday sometime last month. I came to know more about it during the Hackday. And since last week I am reading more about it through the books I am reading about Google for my coursera course Understanding Media by Understanding Google . I participate alone using team name “Shadowfax”. It was great event. I learnt many things, met interesting people and saw wonderful projects. I hope to participate in events likes this in future.